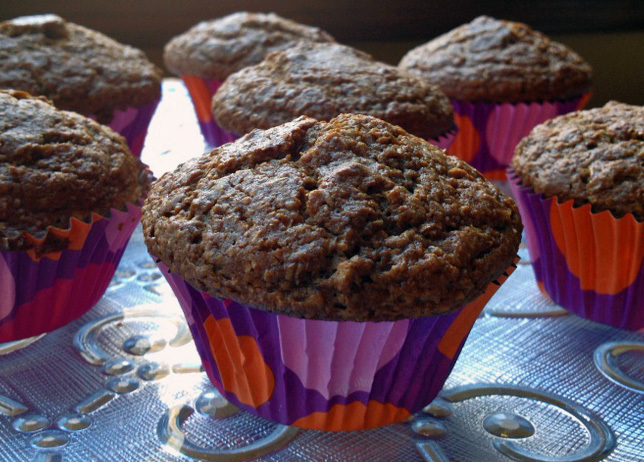 Bran muffins make Phil very very happy, so I tried a new recipe for his favorite morning treat. On a whim, I went with the “back of the bag” recipe in the Bob’s Red Mill Wheat Bran product. I reasoned that they probably tested and re-tested the recipe to make sure whoever baked a batch would love it and buy another bag. 😉 I also thought that using applesauce in the batter would make it moist and flavorful. I was right. Heat the oven to 400°F. Combine wheat bran, flour, baking soda and baking powder. Stir in nuts and raisins. In a separate bowl, blend applesauce, milk, molasses, oil and egg. Add to dry ingredients and stir just until moistened. Spoon into a muffin pan lined with paper muffin cups) and bake for 20 minutes. Makes 12 regular-size muffins. Comments: Between these bran muffins and the first one I blogged about, I think I prefer this batch because of the prominent apple taste that mellows the “hippie factor” of the wheat bran. Did I hit the jackpot with them? And by jackpot I mean bran muffins that match the ones of Phil’s past. Not quite yet there. However, after almost 13 years of marriage, I finally got a hint on one of the issues: size. The muffins he loved so much were bigger. Size does matter after all! A shocking realization. But, here is the tricky part, in those days they did not make them gigantic. They were just slightly bigger. So, now I am on a mission to find a pan that will make a muffin somewhere between “regular” and “jumbo”. As to taste, I am on the right track. Raisins and walnuts, yes. But next time, less apple, and honey instead of molasses.